One Sunday afternoon recently, James Willcox, wearing a Marfa straw cowboy hat, met me at his daughter Kim Darrow’s house to talk about his career as a cowboy, which has spanned over 40 years. James still remembers his start date — March 15, 1969. The foreman, Cecil “Shorty” Hendrix put him right to work. 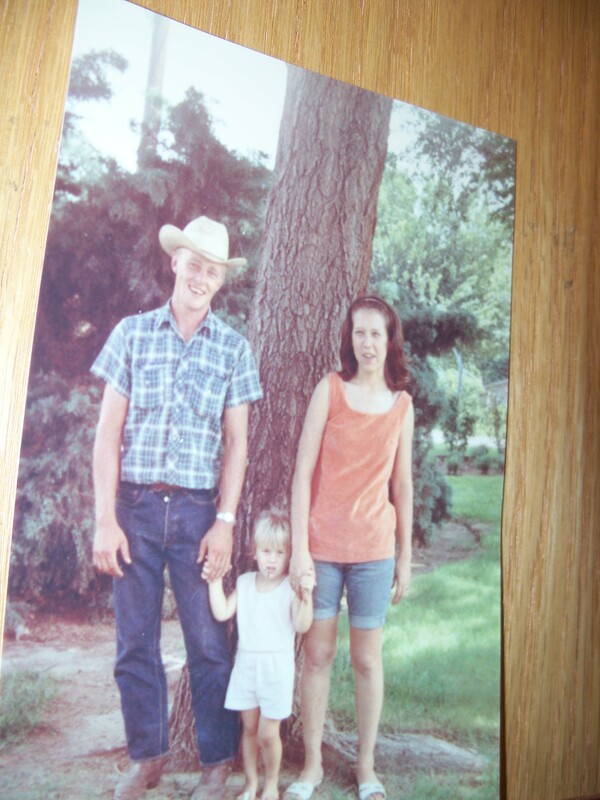 “In the first few days I started, there was 15 inches of snow and I started out riding horses and feeding these cattle. I had a cow horn to call the cattle,” he explained. Shorty gave him three horses to use – Jabo, Solo and Hershey. In addition, he brought his own two horses, Spot and Buster, which he rotated using during the seven-day work week. They worked seven days a week feeding the cattle from cake houses in 13 to 14 pastures per day. “The pastures were a lot bigger than they are today,” James said. “We’d have the 100 lb. bags in the cake houses …. The bunks are four [half] barrels welded together and we laid one bag in each bunk.” Essentially, they were 55 gallon drums cut in half. Once the herd was established, “Frederick didn’t buy any. 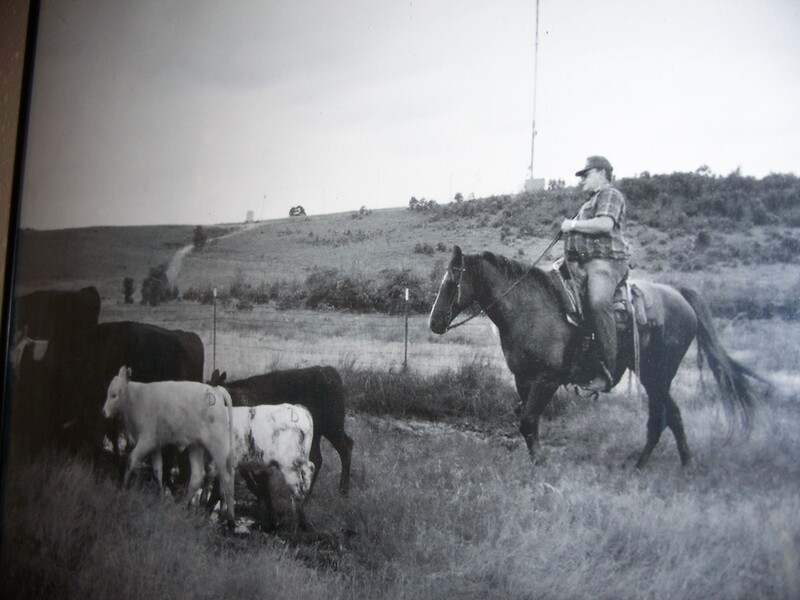 He raised his own and kept the best heifers and kept them for replacements – about 100 per year,” James said. When they reached age 10, Frederick sold them, James said. “He’d keep replacements back and started his herd over – that was Frederick,” James explained. James’ son, James Hagin Willcox, joined us for this part of the interview and explained that the hay bale would be held at the side of the truck by one man and the strings cut by the other so that the hay fell on the ground when the strings were cut. 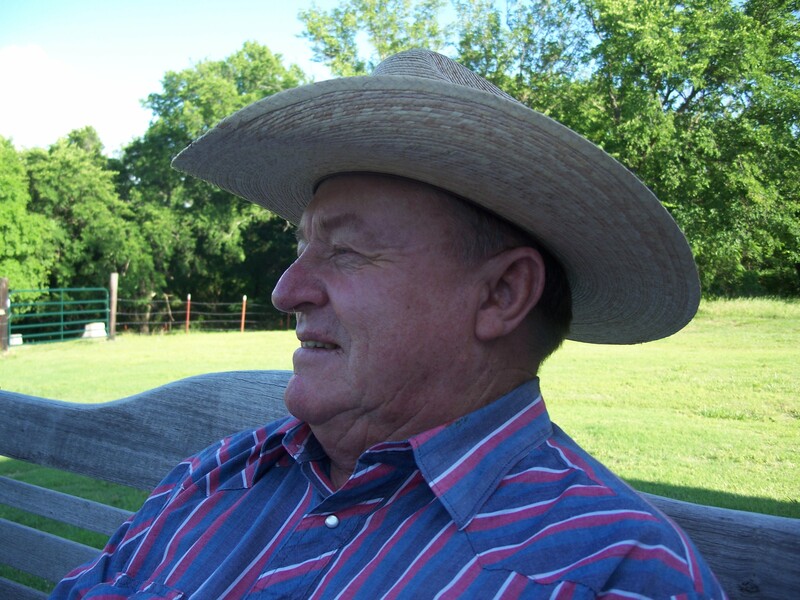 James worked for Bill Thompson who raised horses and had a ranch near Hominy. He would break the American quarter horses, some of which were shipped to Hollywood to be used in movies by Ben Johnson and John Wayne, he said. James said he did not know John Wayne well, but did know Ben Johnson. Regarding Ben Johnson he said, “He was all Osage County – even when he was in Hollywood.” James said knew him well enough to drink from the same cup. James explained the horse-breaking process. “They’d bring 30 at a time to break,” he said. They would “tie four or five of the horses behind a wagon drawn by trained horses. The back of the wagon had a feeder on it. The horses followed the feeder and were led by the trained team hitched to the front of the wagon. However, when other opportunities presented themselves he decided to make a change. James might have taken another offer to work for E. C. Mullendore he said, but his wife’s family, the Hillsberrys were from Sand Springs and the Drummond Ranch was closer to them. The first year they were at the Drummond Ranch, they had some milk cows to earn extra money. “I’d milk and she’d strain the milk and sell the cream and the milk in town (Hominy).” She also churned butter, daughter Jamessa said. In those days, a number of people in the Drummond family had ranches – Frederick Ford, Jack, Gent, Fred Alexander. “You could walk from the Arkansas River all the way to Kansas and be on Drummond Ranches,” James said with a note of pride. He suggested reading the books published about the Drummond fa mily tree to fully understand who was who. James also had a small herd of his own cattle, and still does. He prefers long-horns. “I just love them,” he said. “The cowboys come hunting for calves for roping every year. They buy the calves. “They outlive other cattle. I have one 23 years old that still had a calf.” James sells them after they stop bearing. I asked James to explain how the seasons altered his work on the ranch. “After the snow melted and spring came, we worked cattle … vaccinating the cattle for anaplast, branding the calves, castrating the males and dehorning them,” James said. Another task was putting an earmark on the cattle. Each local rancher in the area used a different earmark. “Fred Ford did an underbit in the left ear. There were probably about five or six of the earmarks,” he explained. They were used so that you could distinguish the cattle. The cattle look at you and raise their ears and you can readily see the earmark, he said. That way if a neighboring rancher’s cattle got on your land, you’d know who to return it to. The earmarks were easier to see than the brands because the cattle typically look at you and raise their ears. In order to complete these tasks, the cowboys had pens to gather the cattle and a series of chutes that they went through. “I helped build about all the pens out there on the ranch,” he said. “I did most of the tripping the chutes and the branding,” James said. R. C. Atkins did most of the castrating. In addition, they used a calving table to inoculate and work the calves. “There was me and Shorty and Frederick, Joe Rusk sometimes, who was building fences – he was there longer than any of us,” he added. “We’d get up at 4 a.m. We’d have to leave the house at 6 o’clock and be in the pasture at daylight. “Going to the backside gathering cattle and seeing the sun come up … not everyone gets to see that,” he said. 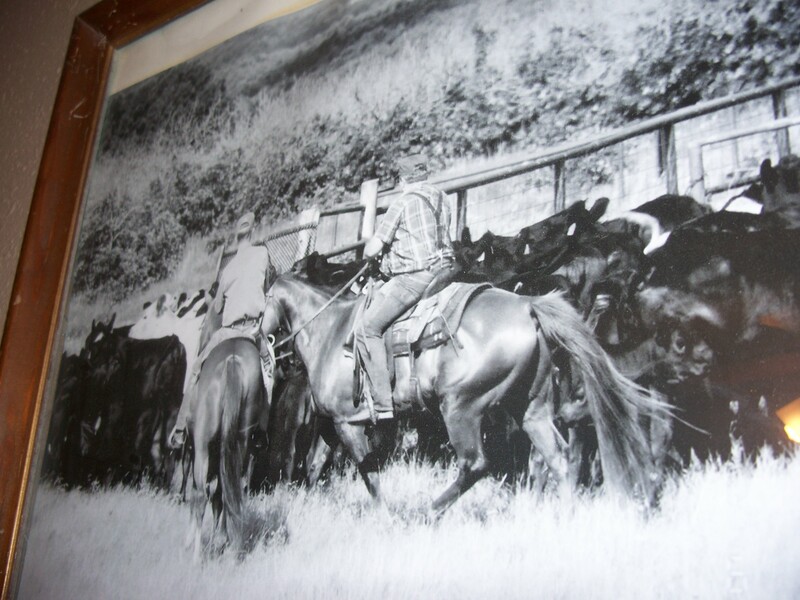 [Shown in photo below L-R: R. C. Atkins and James Willcox rounding up cattle]. “Starting in April we worked the cattle. We’d try to have the cows done and ready by early June for Cattlemen’s Association tour because a lot of cattle were sold during that tour. Fighting grass fires is another regular part of ranch life. 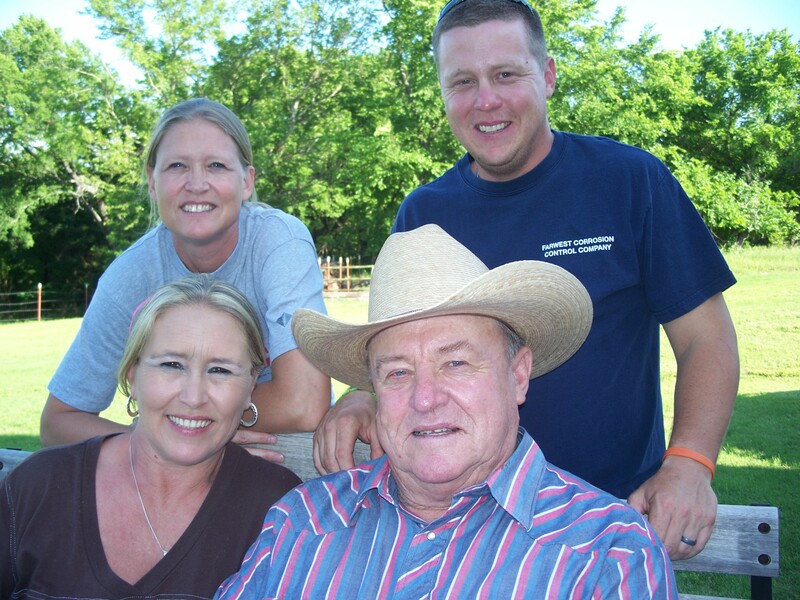 “Hominy ranchers started a rural fire department in 1994. I thought I should go to the meeting and they made me the Hominy Ranchers Rural Fire Department chief!” James said with a chuckle. “They were going to have a different person every year, but I’ve been it since 1994,” he said smiling broadly. The ranches in the area are all tallgrass prairie “that’s the reason we had so many fires,” he said. Early spring used to be a big fire time because people would do controlled burns that got out of control, he explained. His wife, Linda Sue, would make sandwiches for them and drive through the fire to bring it to them, Jamessa said. When Shorty Hendrix retired as foreman of the Frederick Ford Drummond Ranch in January 1987, James took over the position – Jan. 11, 1987, a position he held until Jan. 2011, when he retired. James explained that after the Cattlemen’s tour, when some of the herd had been sold, their summer schedule began. “In the summer we could ride fences, fix it if it was bad. We had to watch for sick cattle. We’d spray cattle for flies. We took our firefighting rig and put a chemical in it and sprayed the cattle. “We shoed horses — broke horses … My favorite part of the job in the summer was we had cookouts … At the cookouts we cooked a whole beef and we’d have a band come and play. “I had some friends who played bluegrass. There’s nothing like having bluegrass at a big cookout,” James said with a smile. “I had a big ole’ black pot to fix beans in – pinto beans, and potato salad, white bread,” he said. They also went to Hominy for parts for the pens and other ranch supplies. “We went to the Pioneer Store. The Drummonds owned that. Now we go to C & G which is out north,” James explained. If they were not sold at the feedlot, the beef was sold “on the rail” after butchering. The rail is the system in the ceiling in the beef processing plant which holds the beef, he explained. “We’d get in trouble if we had chicken,” Jamessa said. “When we ate out, if we bought chicken, Fred wouldn’t pay for it,” James said with a chuckle. He took his daughters with him for some of these trips. He’d “throw the kids on a flatbed truck,” he said. Having no sons at the time, he treated his daughters like sons and taught them to be cowboys, especially the oldest daughter, Jamessa. But God had a surprise around the corner for James. His wife had gotten her tubes tied, and a few months later started having strange symptoms. “Linda went to Springer Clinic on the advice of Frederick Ford Drummond,” James said. At the clinic they told her she was pregnant! Three months later she had a son. They named him James Hagin Willcox. “James works for Indian Electric in Cleveland,” he said with a gleam in his eye. “I went to a palm reader over here in Cleveland. We’d been hauling hay … She said ‘I see two girls and a boy.’ I said ‘No, I don’t.’ She also said ‘You’re going to lose your father in the next year and I did. After James came, I looked back and said, she knew what she was doing,” James said. Around that time fires became an issue again, he added. “We had a fire bug out there who would start fires.” The people were eventually found and stopped, he said. “In July and August we’d ship bigger cattle. We had two sets of calves on the ranch. In October we’d wean the spring calves and ship them to Pawhuska and they’d keep them on the Strohm Ranch until the next spring … when they’d ship them off,” James explained. Although they had had trucks and Jeeps since he began working there, James always used horses for the work. When four-wheelers became popular, he still preferred riding the horses. “I used the four-wheelers for chasing the wild boars,” James said. “Not every year,” James told me later. However, he did confess to chasing wild hogs. And that’s not all: “I’ve caught a couple of live deer and I’m a wild hose-backer,” James said. James confirmed this. “That’s about right,” he said laughing. In addition to all of his work on the ranch, James also “took care of a lot of boys who would come out and work and Frederick Ford would pay them,” he said. They learned discipline and skills that kept them out of trouble. “That’s what I’m more proud of than anything,” James added. James also collects spurs and has won many belt buckles in rodeos, but those stories would have wait for another day. Some of the extended family was arriving and it was about supper time. His daughters were already beginning to cook and his son James was preparing the grill. James lost his wife Linda Sue from COPD on Dec. 6, 2006. He used to smoke three-packs a day himself, but quit in 1978, when he began to see it affecting his lungs. Since his retirement, he tends his small herd of long-horn cattle. James confided that he is thinking of selling some of his long-horns this year. “They’re getting’ older,” he said. These days James has more time to spend with his family. He got knee replacement this spring and is going through the recovery process. “The freedom,” he answered with a broad grin. We shook hands and I thanked him for taking the time to tell me all about his cowboy life.